Class materials: Available for download. We tell you the username and password in the lecture. The lecture slides are available immediately after the lecture. Please bring another pen with a different color (if possible)! You may bring and use a non-programmable calculator, but we think that you do not need it. You MUST switch off your cellphones. You have 2h time to finish the exam (so be there early). You can answer the questions in English or German. All assignments specify how detailed the answer should be to solve it (often written in italics). Please write your full name and your student registration number on every sheet of paper you use to write down solutions. Write the information in the upper right corner. Do this first before writing down any solutions. Sheets without this might possibly not be taken into account for grading. Please start a new page for each separate assignment. Please write your full name and your student registration number on the question sheets. You have to return all question sheets! If you obtain at least 50 percent of all points, you will pass the exam. Bonus points from the homework are not taken into account for passing, only to improve the grade in case of passing. If you have already a group, send an email to Art Tevs with the names of the members of your group. If you do not have a group, come to the first programming tutorial on Friday, May 3rd. We will form groups then. If this does not work for you, send an email to Art Tevs. We will determine the interview slots for the practical assignments and let you know via email. Conflicts will be figured out on an individual basis. April 16: The lecture will start on Tuesday, April 16. This page will be updated during the semester. Recent progress in Geometric Modeling has been stimulated by numerous applications in engineering and multimedia. The purpose of the course is to give an introduction to classical and modern mathematical techniques employed in Geometric Modeling and to demonstrate how these techniques are useful for the design and manufacture of engineering objects of high quality, entertainment and multimedia applications. The course will also serve as a starting point for those students who wish to use Geometric Modeling concepts and ideas in their own research. Topics to be covered include shape interpolation and approximation with piecewise polynomial curves and surfaces, mesh processing, and multiresolution modeling. 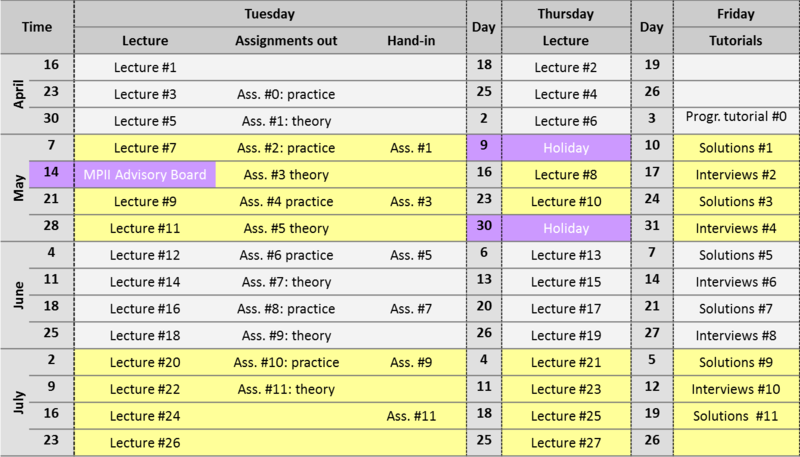 Schedule for the lectures and tutorials. There will be no class on May 9, May 14, and May 30. GeoX is our programing framework for the practical tutorials. The software is open source (GPL2). The course is suitable for MS students. Familiarity with basic computer graphics (or motivation to learn this fast) is desirable. Assessment is based on weekly assignments and a written exam at the end of the semester. Turned in 100% of all homework assignments. Yes, you need to work on all assignments. Gerald Farin: Curves and Surfaces for Computer Aided Geometric Design (Fifth Edition), Morgan Kaufmann, 2002. Alfred Gray: Modern Differential Geometry of Curves and Surfaces with Mathematica (Second Edition), CRC, 1997. Richard O. Duda, Peter E. Hart, David G. Stork: Pattern Classification (Second Edition), Wiley & Sons, 2000. James D. Foley, Andries VanDam und Steven K. Feiner: Computer Graphics: Principles and Practice, Addison-Wesley, 1992. Relevant Topics: Computer Graphcis, Fourier Transform & Signal Theory (Chapter 14.10).